This article is about resonance in physics. For other uses, see Resonance (disambiguation). "Resonant" redirects here. For the phonological term, see Sonorant. In physics, resonance is a phenomenon in which a vibrating system or external force drives another system to oscillate with greater amplitude at a specific preferential frequency. Increase of amplitude as damping decreases and frequency approaches resonant frequency of a driven damped simple harmonic oscillator. Frequencies at which the response amplitude is a relative maximum are known as the system's resonant frequencies or resonance frequencies. At resonant frequencies, small periodic driving forces have the ability to produce large amplitude oscillations. This is because the system stores vibrational energy. Resonance phenomena occur with all types of vibrations or waves: there is mechanical resonance, acoustic resonance, electromagnetic resonance, nuclear magnetic resonance (NMR), electron spin resonance (ESR) and resonance of quantum wave functions. Resonant systems can be used to generate vibrations of a specific frequency (e.g., musical instruments), or pick out specific frequencies from a complex vibration containing many frequencies (e.g., filters). The term resonance (from Latin resonantia, 'echo', from resonare, 'resound') originates from the field of acoustics, particularly observed in musical instruments, e.g., when strings started to vibrate and to produce sound without direct excitation by the player. 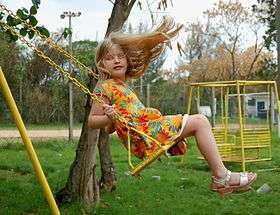 Pushing a person in a swing is a common example of resonance. The loaded swing, a pendulum, has a natural frequency of oscillation, its resonant frequency, and resists being pushed at a faster or slower rate. A familiar example is a playground swing, which acts as a pendulum. Pushing a person in a swing in time with the natural interval of the swing (its resonant frequency) makes the swing go higher and higher (maximum amplitude), while attempts to push the swing at a faster or slower tempo produce smaller arcs. This is because the energy the swing absorbs is maximized when the pushes are "in phase" with the swing's natural oscillations, while some of the swing's energy is actually extracted by the opposing force of the pushes when they are not. 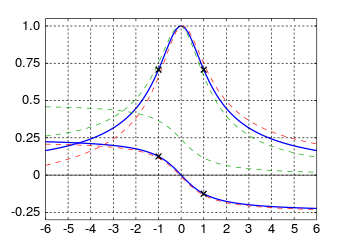 "Universal Resonance Curve", a symmetric approximation to the normalized response of a resonant circuit; abscissa values are deviation from center frequency, in units of center frequency divided by 2Q; ordinate is relative amplitude, and phase in cycles; dashed curves compare the range of responses of real two-pole circuits for a Q value of 5; for higher Q values, there is less deviation from the universal curve. Crosses mark the edges of the 3 dB bandwidth (gain 0.707, phase shift 45° or 0.125 cycle). The intensity is defined as the square of the amplitude of the oscillations. This is a Lorentzian function, or Cauchy distribution, and this response is found in many physical situations involving resonant systems. Γ is a parameter dependent on the damping of the oscillator, and is known as the linewidth of the resonance. Heavily damped oscillators tend to have broad linewidths, and respond to a wider range of driving frequencies around the resonant frequency. The linewidth is inversely proportional to the Q factor, which is a measure of the sharpness of the resonance. In electrical engineering, this approximate symmetric response is known as the universal resonance curve, a concept introduced by Frederick E. Terman in 1932 to simplify the approximate analysis of radio circuits with a range of center frequencies and Q values. A physical system can have as many resonant frequencies as it has degrees of freedom; each degree of freedom can vibrate as a harmonic oscillator. Systems with one degree of freedom, such as a mass on a spring, pendulums, balance wheels, and LC tuned circuits have one resonant frequency. Systems with two degrees of freedom, such as coupled pendulums and resonant transformers can have two resonant frequencies. As the number of coupled harmonic oscillators grows, the time it takes to transfer energy from one to the next becomes significant. The vibrations in them begin to travel through the coupled harmonic oscillators in waves, from one oscillator to the next. So the resonant frequencies of resonators, called normal modes, are equally spaced multiples of a lowest frequency called the fundamental frequency. The multiples are often called overtones. There may be several such series of resonant frequencies, corresponding to different modes of oscillation. The Q factor or quality factor is a dimensionless parameter that describes how under-damped an oscillator or resonator is, or equivalently, characterizes a resonator's bandwidth relative to its center frequency. Higher Q indicates a lower rate of energy loss relative to the stored energy of the oscillator, i.e., the oscillations die out more slowly. A pendulum suspended from a high-quality bearing, oscillating in air, has a high Q, while a pendulum immersed in oil has a low Q. To sustain a system in resonance in constant amplitude by providing power externally, the energy provided in each cycle must be less than the energy stored in the system (i.e., the sum of the potential and kinetic) by a factor of Q/2π. Oscillators with high-quality factors have low damping, which tends to make them ring longer. The quality factor of oscillators varies substantially from system to system. Systems for which damping is important (such as dampers keeping a door from slamming shut) have Q = 1/2. Clocks, lasers, and other systems that need either strong resonance or high frequency stability need high-quality factors. Tuning forks have quality factors around Q = 1000. The quality factor of atomic clocks and some high-Q lasers can reach as high as 1011 and higher. There are many alternate quantities used by physicists and engineers to describe how damped an oscillator is that are closely related to its quality factor. Important examples include: the damping ratio, relative bandwidth, linewidth, and bandwidth measured in octaves. Mechanical resonance is the tendency of a mechanical system to absorb more energy when the frequency of its oscillations matches the system's natural frequency of vibration than it does at other frequencies. It may cause violent swaying motions and even catastrophic failure in improperly constructed structures including bridges, buildings, trains, and aircraft. When designing objects, engineers must ensure the mechanical resonance frequencies of the component parts do not match driving vibrational frequencies of motors or other oscillating parts, a phenomenon known as resonance disaster. Avoiding resonance disasters is a major concern in every building, tower, and bridge construction project. As a countermeasure, shock mounts can be installed to absorb resonant frequencies and thus dissipate the absorbed energy. The Taipei 101 building relies on a 660-tonne pendulum (730-short-ton)—a tuned mass damper—to cancel resonance. Furthermore, the structure is designed to resonate at a frequency that does not typically occur. Buildings in seismic zones are often constructed to take into account the oscillating frequencies of expected ground motion. In addition, engineers designing objects having engines must ensure that the mechanical resonant frequencies of the component parts do not match driving vibrational frequencies of the motors or other strongly oscillating parts. Clocks keep time by mechanical resonance in a balance wheel, pendulum, or quartz crystal. The cadence of runners has been hypothesized to be energetically favorable due to resonance between the elastic energy stored in the lower limb and the mass of the runner. Acoustic resonance is an important consideration for instrument builders, as most acoustic instruments use resonators, such as the strings and body of a violin, the length of tube in a flute, and the shape of, and tension on, a drum membrane. Like mechanical resonance, acoustic resonance can result in catastrophic failure of the object at resonance. The classic example of this is breaking a wine glass with sound at the precise resonant frequency of the glass, although this is difficult in practice. Electrical resonance occurs in an electric circuit at a particular resonant frequency when the impedance of the circuit is at a minimum in a series circuit or at maximum in a parallel circuit (or when the transfer function is at a maximum). An optical cavity, also called an optical resonator, is an arrangement of mirrors that forms a standing wave cavity resonator for light waves. Optical cavities are a major component of lasers, surrounding the gain medium and providing feedback of the laser light. They are also used in optical parametric oscillators and some interferometers. Light confined in the cavity reflects multiple times producing standing waves for certain resonant frequencies. The standing wave patterns produced are called "modes". Longitudinal modes differ only in frequency while transverse modes differ for different frequencies and have different intensity patterns across the cross-section of the beam. Ring resonators and whispering galleries are examples of optical resonators that do not form standing waves. Different resonator types are distinguished by the focal lengths of the two mirrors and the distance between them; flat mirrors are not often used because of the difficulty of aligning them precisely. The geometry (resonator type) must be chosen so the beam remains stable, i.e., the beam size does not continue to grow with each reflection. Resonator types are also designed to meet other criteria such as minimum beam waist or having no focal point (and therefore intense light at that point) inside the cavity. Optical cavities are designed to have a very large Q factor. A beam reflects a large number of times with little attenuation—therefore the frequency line width of the beam is small compared to the frequency of the laser. Additional optical resonances are guided-mode resonances and surface plasmon resonance, which result in anomalous reflection and high evanescent fields at resonance. In this case, the resonant modes are guided modes of a waveguide or surface plasmon modes of a dielectric-metallic interface. These modes are usually excited by a subwavelength grating. In celestial mechanics, an orbital resonance occurs when two orbiting bodies exert a regular, periodic gravitational influence on each other, usually due to their orbital periods being related by a ratio of two small integers. Orbital resonances greatly enhance the mutual gravitational influence of the bodies. In most cases, this results in an unstable interaction, in which the bodies exchange momentum and shift orbits until the resonance no longer exists. Under some circumstances, a resonant system can be stable and self-correcting, so that the bodies remain in resonance. Examples are the 1:2:4 resonance of Jupiter's moons Ganymede, Europa, and Io, and the 2:3 resonance between Pluto and Neptune. Unstable resonances with Saturn's inner moons give rise to gaps in the rings of Saturn. The special case of 1:1 resonance (between bodies with similar orbital radii) causes large Solar System bodies to clear the neighborhood around their orbits by ejecting nearly everything else around them; this effect is used in the current definition of a planet. NMR Magnet at HWB-NMR, Birmingham, UK. In its strong 21.2-tesla field, the proton resonance is at 900 MHz. Nuclear magnetic resonance (NMR) is the name given to a physical resonance phenomenon involving the observation of specific quantum mechanical magnetic properties of an atomic nucleus in the presence of an applied, external magnetic field. Many scientific techniques exploit NMR phenomena to study molecular physics, crystals, and non-crystalline materials through NMR spectroscopy. 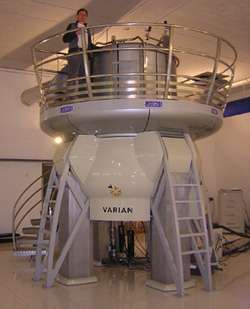 NMR is also routinely used in advanced medical imaging techniques, such as in magnetic resonance imaging (MRI). All nuclei containing odd numbers of nucleons have an intrinsic magnetic moment and angular momentum. A key feature of NMR is that the resonant frequency of a particular substance is directly proportional to the strength of the applied magnetic field. It is this feature that is exploited in imaging techniques; if a sample is placed in a non-uniform magnetic field then the resonant frequencies of the sample's nuclei depend on where in the field they are located. Therefore, the particle can be located quite precisely by its resonant frequency. Electron paramagnetic resonance, otherwise known as Electron Spin Resonance (ESR) is a spectroscopic technique similar to NMR, but uses unpaired electrons instead. Materials for which this can be applied are much more limited since the material needs to both have an unpaired spin and be paramagnetic. The Mössbauer effect is the resonant and recoil-free emission and absorption of gamma ray photons by atoms bound in a solid form. Resonance in particle physics appears in similar circumstances to classical physics at the level of quantum mechanics and quantum field theory. However, they can also be thought of as unstable particles, with the formula above valid if Γ is the decay rate and Ω replaced by the particle's mass M. In that case, the formula comes from the particle's propagator, with its mass replaced by the complex number M + iΓ. The formula is further related to the particle's decay rate by the optical theorem. The dramatically visible, rhythmic twisting that resulted in the 1940 collapse of "Galloping Gertie", the original Tacoma Narrows Bridge, is misleadingly characterized as an example of resonance phenomenon in certain textbooks. The catastrophic vibrations that destroyed the bridge were not due to simple mechanical resonance, but to a more complicated interaction between the bridge and the winds passing through it—a phenomenon known as aeroelastic flutter, which is a kind of "self-sustaining vibration" as referred to in the nonlinear theory of vibrations. Robert H. Scanlan, father of bridge aerodynamics, has written an article about this misunderstanding. For more details on this topic, see Mechanical resonance. The rocket engines for the International Space Station (ISS) are controlled by an autopilot. Ordinarily, uploaded parameters for controlling the engine control system for the Zvezda module make the rocket engines boost the International Space Station to a higher orbit. The rocket engines are hinge-mounted, and ordinarily the crew doesn't notice the operation. On January 14, 2009, however, the uploaded parameters made the autopilot swing the rocket engines in larger and larger oscillations, at a frequency of 0.5 Hz. These oscillations were captured on video, and lasted for 142 seconds. ↑ Katsuhiko Ogata (2005). System Dynamics (4th ed.). University of Minnesota. p. 617. ↑ Ajoy Ghatak (2005). Optics, 3E (3rd ed.). Tata McGraw-Hill. p. 6.10. ISBN 978-0-07-058583-6. ↑ A. E. Siegman (1986). Lasers. University Science Books. pp. 105–108. ISBN 978-0-935702-11-8. ↑ Frederick Emmons Terman (1932). Radio Engineering. McGraw-Hill Book Company. ↑ William McC. Siebert (1986). Circuits, Signals, and Systems. MIT Press. p. 113. ISBN 978-0-262-19229-3. ↑ James H. Harlow (2004). Electric Power Transformer Engineering. CRC Press. pp. 2–216. ISBN 978-0-8493-1704-0. ↑ Michael H. Tooley (2006). Electronic Circuits: Fundamentals and Applications. Newnes. pp. 77–78. ISBN 978-0-7506-6923-8. ↑ Snyder; Farley (2011). "Energetically optimal stride frequency in running: the effects of incline and decline". The Journal of Experimental Biology. 214: 2089–95. doi:10.1242/jeb.053157. Retrieved 1 Sep 2014. ↑ Harry F. Olson Music, Physics and Engineering. Dover Publications, 1967, pp. 248–249. "Under very favorable conditions most individuals can obtain tonal characteristics as low as 12 Hz." ↑ K. Yusuf Billah and Robert H. Scanlan (1991). "Resonance, Tacoma Narrows Bridge Failure, and Undergraduate Physics Textbooks" (PDF). American Journal of Physics. 59 (2): 118–124. Bibcode:1991AmJPh..59..118B. doi:10.1119/1.16590. Retrieved 2011-05-29. ↑ Oberg, James (4 February 2009). "Shaking on Space Station Rattles NASA". NBC News. Definition of Resonance - "The increase in amplitude of oscillation of an electric or mechanical system exposed to a periodic force whose frequency is equal or very close to the natural undamped frequency of the system."